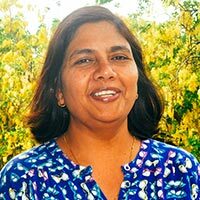 Leena Tripathi is Principal Scientist in Plant Biotechnology at International Institute of Tropical Agriculture (IITA), Kenya. She is Deputy Director of East Africa Hub and Country Representative of IITA-Kenya. Dr. Tripathi is leading the transgenic research at IITA based at Biosciences for east and central Africa (BecA) hub. Her primary research focuses on genetic improvement of banana/plantain, cassava, enset (false banana) and yam for disease and pest resistance. She has global collaboration including advanced labs in USA, UK, Australia and National partners in Kenya, Uganda, Ethiopia, Malawi and regional partners. Dr. Tripathi obtained her Ph.D. in Plant Molecular Biology and M.Sc. in Molecular Biology & Biotechnology. She worked at University of North Carolina at Greensboro, USA before joining IITA. She has been involved in Plant Biotechnology research for more than 20 years with specific interests in crop improvement.